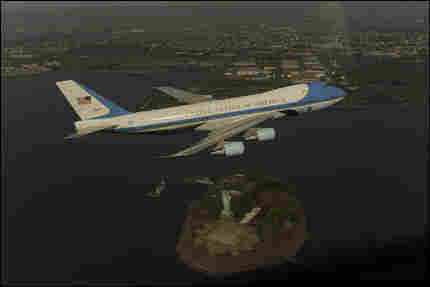 Air Force One Flyover Fallout : Blog Of The Nation Remember the Air Force One photo op over the New York City that brought back images of 9/11? Here's the picture that launched a thousand 911 calls. Word from the White House today: "The President has accepted the resignation of Louis Caldera as Director of the White House Military Office." That's the office that approved Air Force One's photo op flyover above Manhattan.. and the resulting flood of frantic 911 calls about a possible terrorist attack. The White House says a review is underway to make sure "that such an incident never occurs again." In the meantime, here's one photo that resulted from all this.